Model-Driven Development (MDD) tools for Rich Internet Applications (RIAs) development are focused on software modeling, and they leave automatic code generation in a second term. On the other hand, Rapid Application Development (RAD) tools for RIAs development enable developers to save development time and effort by leveraging reusable software components. AlexandRIA is a RAD tool that allows developers to automatically generate both source and native code of multi-device RIAs from a set of preferences selected throughout a wizard following the phases of a User Interface (UI) pattern-based code generation approach for multi-device RIAs. 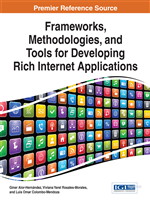 In this chapter, the use of the UI design process behind AlexandRIA is demonstrated by means of a sample development scenario addressing the development of a cloud services Application Programming Interfaces (APIs)-based cross-platform mobile RIA. This scenario is further revisited in a case study that addresses the automatic generation of an equivalent application using AlexandRIA. AlexandRIA automates a UI pattern-based code generation approach for multi-device RIAs which is intended to address the following drawbacks of current proposals on RIAs engineering such as RUX-Method (Linaje et al., 2007), PPRD (Martínez-Nieves et al., 2010) and UWE-R (Machado et al., 2009): they do not entirely address multi-device RIAs; therefore, they do not cover the development of multi-device RIAs in an automatic or semi-automatic way.